Facebook announced today that it has found evidence of another coordinated election interference campaign on its site — a likely effort to influence the 2018 U.S. Midterms. 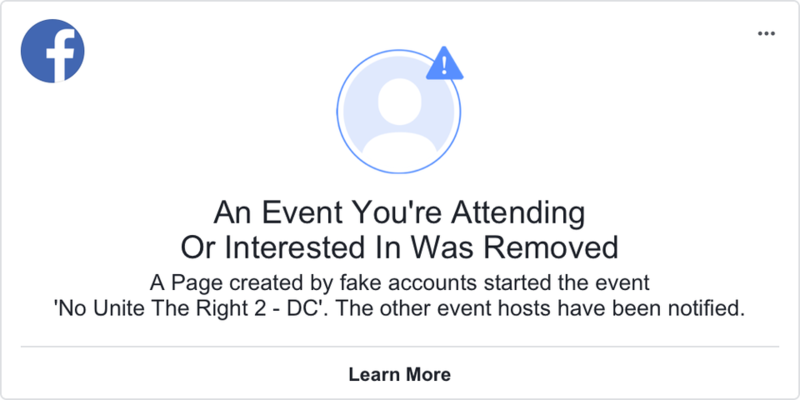 This is the second instance of a high-profile effort to weaponize Facebook with the goal of influencing a U.S. election. Last year, it was discovered that foreign actors — largely based in Russia — coordinated a similar campaign with the creation of numerous fake accounts and the spread of divisive information, much of it false. This time, things are a bit different. Facebook caught a smaller number of accounts, but did so much earlier on — and the company is less confident about saying, for sure, who could be behind it. In its official statement, Facebook said it removed 32 Pages and accounts — eight Facebook Pages, 17 Facebook profiles, and seven Instagram accounts — for what it describes as “inauthentic behavior” that intends to mislead network users. Altogether, Facebook said, more than 290,000 accounts followed one or more of the Pages removed. 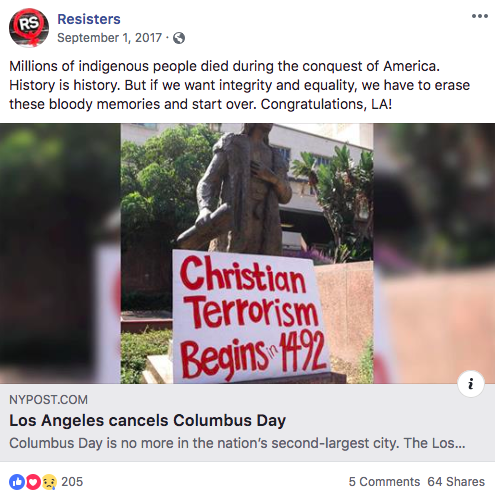 Of the Pages, those with the highest following included “Aztlan Warriors,” “Black Elevation,” “Mindful Being,” and “Resisters.” The last one, Resisters, worked with five other authentic Pages to organize an event called “No Unite the Right 2 – DC,” which it created to protest a “Unite the Right” scheduled for this August in Washington, D.C.
Facebook says it plans to inform these users of what it has discovered this afternoon. Combined, these accounts created 9,500 organic posts, running roughly 150 ads across Facebook and Instagram that cost a total of $11,000. The most recent ad was created in June 2018 (and the first, the company says, in April 2017 — the same month Facebook published a white paper on the potential misuse of its platform. As for the content of these ads, Facebook has released a small sample. There are some similarities between what was shared today and the Russian-bought content that was released by the U.S. House Permanent Select Committee on Intelligence (HPSCI) in May 2018. Similar to the Russian-bought content revealed last spring, the ads released today pertain to some of the most divisive issues in the U.S., many of which are center stage in the months leading up to a major election — things like race, gender rights, and religion. The U.S. 2018 Midterm Elections are taking place this November. Here’s where things start to get tricky. When Facebook discovered and described the weaponization of its platform to influence the 2016 U.S. presidential election, the evidence of Russian interference — specifically, the IRA — was clear, with the company able to trace that activity back to these parties. However, certain lawmakers disagree. Senator Mark Warren — whose office yesterday published a paper outlining what regulation of Big Tech might look like — showed no hesitation in identifying Facebook’s findings as “evidence” of Russian interference. Facebook has made no secret of its efforts to curb the spread of misinformation and prevent election interference on its site since the 2016 election meddling was first discovered — which was followed by the discovery that personal user data was improperly obtained and abused by data mining and voter profiling firm, Cambridge Analytica. Since then, Facebook has made a suite of changes to the way it publishes and displays ads — from a major shift in its News Feed algorithm, to showing more content from friends and family, to special labels and options to learn more about issue-based ads. The announcement follows a string of bad days for Facebook. Last week, its Q2 earnings call proved to be somewhat disastrous, as a miss on estimates and reported decrease in active users sent the company’s stock price into a tailspin. Facebook began to financially rebound — and as of publishing this story, its stock price does not appear to have been significantly impacted by today’s revelations. The same day as the earnings call, it was revealed that Facebook COO Sheryl Sandberg — along with Twitter CEO Jack Dorsey and a yet-to-be-disclosed representative from Google — will testify before the Senate Select Committee on Intelligence. Tomorrow, that will be preceded by an open hearing held by the same committee, where lawmakers will hear testimony from third-party experts on foreign influence in social media. As Facebook has indicated, the investigation is ongoing and more information is expected to be revealed as it proceeds.